You Are Here: Home → On Baseball: Yankees vs. Red Sox Is the Stuff of Movies. Just Ask Spike Lee. On Baseball: Yankees vs. Red Sox Is the Stuff of Movies. Just Ask Spike Lee. As Fenway Park was beginning to fill up on Saturday night, the Yankees took the last of their batting practice hacks, gathered up the baseballs left on the field and retreated toward their clubhouse. As they did, the ballplayers — experts at looking through everyone while seeing everything — allowed themselves to catch the eye of a fan at the edge of the third-base dugout. 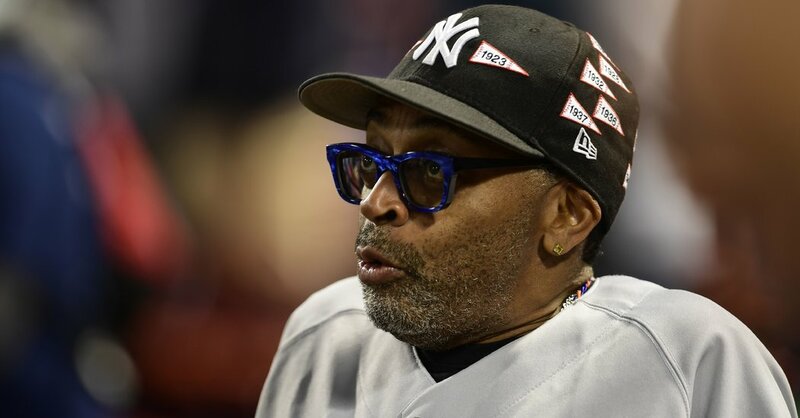 There, dressed in a traveling gray Derek Jeter jersey and a Yankees cap embroidered with flags from their 27 world championships, was Spike Lee. One by one, Dellin Betances, Aaron Judge, Andrew McCutchen and Brett Gardner stopped and greeted Lee with a handshake, a hug and a quick word. The moment underscored what baseball has been missing in the 14 seasons since the Red Sox and Yankees met in back-to-back storybook playoff series. Yes, they have each won titles since, and there has been no shortage of compelling October theater in recent years. But until last year, they had not even been in the playoffs the same year since 2009. To have the Yankees and the Red Sox relevant in the same October and on the field together, well, it was enough to spring Lee from a family weekend on Martha’s Vineyard. “Lakers-Celtics, Red Sox-Yankees, there’s certain rivalries — U.S.C.-Notre Dame, Ali-Frazier — that we want to see,” said Lee, who was, naturally, wearing a Mars Blackmon backpack. This series, which resumed with Game 3 Monday night at Yankee Stadium, has done little to knock down that argument as the self-important, parochial sentiments of the Northeast corridor elite. As much kvetching as there has been about the Red Sox and the Yankees hogging the prime-time spotlight during the divisional round, consider the Game 1 numbers. The Yankees and the Red Sox gave TBS the most-watched division series opener (5.6 million viewers) since 2010 — a 59 percent increase over last season’s Chicago Cubs-Washington Nationals series. Yankees-Red Sox was the only one of the four division series that was tied after two games and, to a large degree, the only one that has been compelling enough to follow. By the second inning of Monday’s game, in fact, it was the only division series still going. The Los Angeles Dodgers — with the exception of Ronald Acuna’s grand slam in Game 3 — had their way with the Atlanta Braves in their three-games-to-one win in a National League division series. The Houston Astros took the teeth out of the Cleveland Indians bats, trouncing them by a combined score of 21-6 over a three-game sweep. And in Milwaukee’s sweep of punchless Colorado, the most compelling character was Erik Kratz, the Brewers’ 38-year-old catcher who was plucked earlier this season from the Scranton/Wilkes-Barre RailRiders, the Yankees’ Class AAA affiliate. The Red Sox and the Yankees, in contrast, have provided plenty of captivating moments. There were tone-setting home runs by J. D. Martinez and Judge, a tragic figure in David Price (and a potential one in Giancarlo Stanton), and game-changing at-bats like Brandon Workman’s fanning Gleyber Torres with the bases loaded and Gary Sanchez’s belting a booming home run off Eduardo Rodriguez. Then there was the statement Judge made as he left Fenway Park late Saturday night: hauling a boom box blaring Frank Sinatra’s “New York, New York” as he made his way to a team bus. It was the type of swagger that should further endear him to Yankees fans. While attendance at Yankee Stadium has not reached the level it was in 2012, it started to become far more vibrant toward the end of last season, suggesting that even if Yankees fans want to win before anything else, it might just feel better now than when the team had tired characters. The power of that connection should not be underestimated. Consider a 12-year-old boy from Brooklyn in 1969. Lee was captivated that year by the Mets. He rattled off the lineup: Tom Seaver and Jerry Koosman at the head of the rotation. Then he worked his way around the horn: Ed Kranepool at first, Ken Boswell at second, Bud Harrelson at shortstop and Ed Charles at third. From left to right in the outfield: Cleon Jones, Tommie Agee and Ron Swoboda. Lee was at Shea Stadium when Gary Gentry shut out St. Louis to clinch the division, when Nolan Ryan got the final out of a sweep of Atlanta in the league championship series and when Baltimore’s Davey Johnson flied out to Jones to clinch the World Series. Lee said he kept a patch of grass he’d dug up after the World Series for two years until his mother threw it out. The Mets reached the World Series again in 1973, but as Lee grew up, they became bad and boring, and by the time he was off at Morehouse College, the Yankees had begun to capture his interest. The Yankees reached the World Series in 1976 and won it in 1977 and 1978, but it was not the winning resonated with Lee. It was two players: second baseman Willie Randolph, a fellow native of Brooklyn who arrived before the 1976 season, and Reggie Jackson, the brash slugger who proved to be made for New York and came a year later. Asked what intrigued him, as a filmmaker, about these Red Sox and Yankees, he said he looked at the teams like a general manager might. The Yankees and the Red Sox, though, have proven to be teams that are well crafted, with stars and role players alike. Lee, showing his faith in the Yankees, believed even before Game 2 that the Yankees would win the series, but he said it would take all five games to do so. “The hard way,” he said. And, if history is a guide in this rivalry, perhaps the only way.